In the photo above I am teaching the technique “Kannon-gakure” (a.k.a God Hiding). This is done within a house or residence of the enemy where you are trying to gain or take vital information. 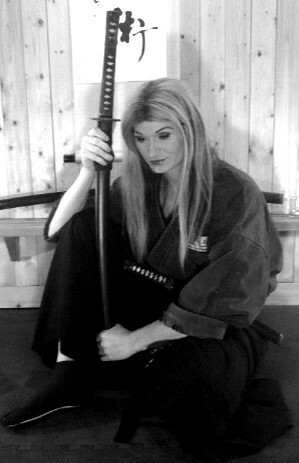 However, the photo above is me demonstrating the principals of the technique during the 2011 shinobi no mono stealth camp. When you are doing this you are to be walking within the hallway, or residence, you are also to be wearing dark colors and to be walking in the shadows of the hallway as well. When you sense that the enemy is walking near, you stay within the shadows and press your body up against the wall. Cover your mouth with your sleeve of your jacket and breathe as little as possible, this is because when they walk by you, they are so close that they will be able to feel your breathe on them, so total concentration is needed! It’s written that you have to say this “within” your mouth, which can be translated as saying this in your head. Clearly if you say it out loud they will spot you and then kill you. It is also said that this is the mantra that you say before you go on the mission, so that there is no need to say it when you are on a mission. However; the usage of this is key as it makes sense that you would say it when on the mission in your head to calm your nerves and anxiety that you are feeling as the man that wants to kill you is full armed and walking within inches of your body. This is to be done wearing the classical shinobi garb (shinobi shōzoku 忍び装束) and also making use of the zukin (hood) as this will help aid cover the natural tones and silhouette of the human form. However this can also be done wearing dark colors as well and using one of the basic tools of the ninja the “sanjaku tengui”. In this photo above I was not wearing the shinobi shōzoku (忍び装束) but utilized what I had so that I could demonstrate the use of this technique to the students.